'S e àilean a tha ann am Farafra (Arabais: الفرافرة, Beurla: Farafra Oasis). Tha e suidhichte anns an Fhàsach Libianach aig 27.06° Tuath agus 27.97° Ear anns an Èipheit a Deas. 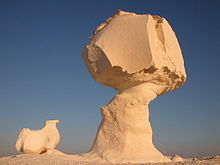 Tha am Fàsach Geal (Sahara el Beyda neo White Desert) mu 45 cilemeatair san àirde a tuath Farafra. Tha dath na fàsaich a’ coimhead geal. Air a tharraing à "https://gd.wikipedia.org/w/index.php?title=Farafra&oldid=517504"